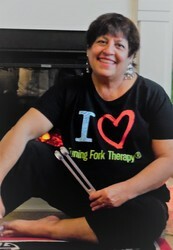 Enjoy this FREE online course to learn all the basics of using tuning forks. There is NO certificate and NO ce's offered for completing this FREE course, only the knowledge that you will gain from taking it. Most of the information is used in my training manuals. I have searched the Internet for interesting and informative information on the science of sound, sound waves, vibrational frequency and more. Enjoy the journey! If you have found a site you feel would be of great value to other students, please drop me an email. Remember, this is a non commercial page for educational purposes only!